That auction has ended. It was a couple of days back. That SS3 isn't rare but finding one at the price it sold for is rare indeed. Another one kicks Buyee off the bidding list. Me neither. So, far so good with Buyee in regards to bidding. Not a bid canceled. Maybe it's me who has a poor choice in deciding what auction I choose to bid upon. I fail to understand this sorta limitation they're suggesting because I've had no issues with EMS in the past and actually have had items delivered to me without any problems. Now my options are UPS or SAL or to have it delivered to someone in Japan. What do you guys suggest I should do? SAL is the best shipping service; cheapest, and no fees or any other BS. UPS is garbage. Yeah. But Buyee is asking me to pay again for SAL. Is there a weight limit on SAL? And how long does it take? Does the snipe feature work well? I've never done any bidding before, and I just lost an auction for some posters I wanted, so I was going to try the snipe instead. Keep in mind the time the auction ended was when I was asleep being an australian, and staying up to bid isn't really an option for me. It works sometimes but isn't much helpful if you are bidding on a hot/rare item wherein the thing is being sniped more any political figure on an international hit list! Most of the auctions in YAJ have a closing time when I just wake up for the day. So I manage to do just fine. Has anybody purchased their Ichiban Kuji Oozaru Vegeta off YJ? If so, how much did shipping cost you as well as other fees? I currently have a bid on one. 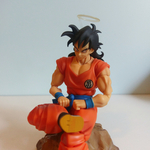 I got the Gohan one from manda, it was 4500 yen + like 4000 yen on shipping. What about the shipping price to buyee? Or did you not go through them? Well for buyee I can only tell you that they will stuck up some fees on you, shipping cost from seller to their warehouse + minor fees + the intl shipping. I got mine through Buyee for 8000 yen shipped. Got a lil' ripped by customs but that's ok.
so what was your bid? I started bidding on it at around 1200 yen or so and put in my max at 3700. When I checked back later, I'd won the auction.